LG K10(2017) with 2GB RAM Price Specification Description Nigeria India. LG K10(2017) is among the new K-series smart phones (K3, K4, K8 and Stylus 3) announced by LG all set for 2017 release. The smart phone will be launched in CES January, 2017. LG K10, K8 and Stylus 3 run Android 7.0 Nougat. 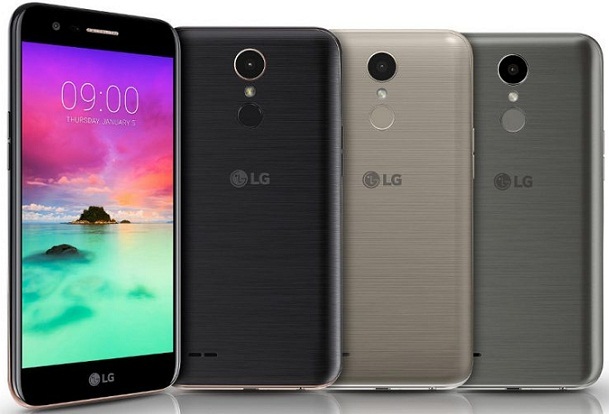 LG K3 and K4 which are budget devices will run Android 6.0 Marshmallow instead. LG K10(2017) impressses with its 120 degree wide angle selfie camera. The smart phone is 5.3 inches in size with Full HD IPS Touch Display. The screen has on it 2.5D Arc Glass design and the outer surface features metallic U frame with 7.9mm height. The smart phone is powered by MediaTek MT6750 chipset. It has 1.5GHz Octa Core processor packed with Mali T860 GPU. The RAM is 2GB and the inbuilt storage is 16GB or 32GB option expandable via microSD to 2TB. LG K10(2017) sports a 13MP rear camera with 120 degree wide angle and also 5MP front facing camera for selfies and video chat. The device also sports a finger print sensor. The phones dimension is 148.7*75.3*7.9mm and weighs 142g. The battery, is a removable 2800mAh capacity cell. The smart phone runs Android 7.0 Nougat. It has support for 4G LTE, Wifi, GPS, NFC and Bluetooth.